I make clear to all my private students that I am not a theory-first teacher. I prefer to get hands-on and have them making music as soon as possible. The one exception to this is in the way I teach them to strum rhythms on the guitar. Your strumming hand (normally your right if you’re right handed) only has two useful directions to hit the strings, up and down. If you understand why certain strums are ups and others are downs then it builds a fundamental security with rhythm. In fact, if you practice the following method, quite soon you’ll never wonder how to strum a rhythm again. When we talk about how to strum rhythms in music, what we’re essentially doing is breaking down a song into little chunks. That song might be a 3 minute Beatles tune or a 17 minute Rachmaninov symphony. Either way, we always arrange the rhythm the same way. 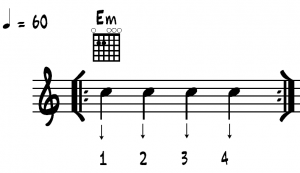 This note is called a ‘Quarter Note’ as you can fit four of them in a bar, i.e, 4 ¼ notes = 1 bar. The 4/4 at the start tells us that there are 4 beats in the bar. you play a down strum. Down strums are always on the beat, so if you’re counting 1, 2, 3, 4 as in previous chapters, every time you say a number you strum downwards on the guitar. Set your metronome to play at 60 beats per minute, then play a down strum on each click while holding down the chord of E minor. While this is a great method for developing good solid rhythm, music would be extremely dull if all our rhythms were like this. One way to add interest is to double up on each quarter (1/4) note. In other words, imagine splitting each each 1/4 note in half. This gives us 8 notes in the bar, and these are imaginatively called 1/8 or eighth notes. That is the end of the mathematics, I promise! As you can see in the previous example, when we strum rhythms as 1/8th notes, our down strum is still in exactly the same place. All we need to do is squeeze in an up strum between each down. This up-strum should be exactly in the middle of each down. Set your metronome to 60 beats per minute and begin by playing just a down strum on each click. When you’re ready, add up-strums in the middle of each down. Count out loud ‘1 and 2 and 3 and 4 and ’, etc. Listen to the audio example to help you. Once again, while we have added interest to our playing by adding more notes, music would be very repetitive if this was all the rhythm we ever played. Now let’s learn to combine 1/4 notes and 1/8th notes to add variety. Beat 1 is a down strum, beat 2 is a down and an up, beat 3 is a down, as is beat 4. One. Two And Three. Four. – Down. Down Up Down Down. Say it in time, rhythmically and confidently. Saying the rhythm out loud really helps your brain to process what it needs to do when it comes to strumming the rhythm in time. When you’re ready, strum it confidently. Don’t worry about any buzzes in your fretting hand. Ignore them; we’re only focusing on how to strum rhythms on the guitar. Say out loud One and Two. Three and Four. Down Up Down. Down Up Down. If it helps, you might want to think jin gle bells jin gle bells. Throughout any rhythm you play on the guitar, the strumming hand never stops moving. It is constantly moving up and down in time. Downward movements are on the beats, upward movements are between the beats. This keeps you in time like a little built-in conductor. To create rhythms all we do is sometimes hit the strings and sometimes miss them. Down Up Down Up Down. Down. Down. Down. Down Up Down. With each rhythm, remember to keep your strumming hand moving down and up all the time. To play a 1/4 note, simply don’t strike the guitar on the up-strum.